A sportive Audi 100S was shown at the IAA in Frankfurt in the Autumn of 1969. 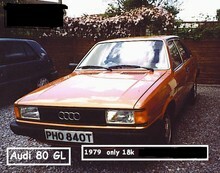 This was a two-door coupe on a shortened Audi 100 underframe. The body provided space for four occupants but was only 523/8 in (133 cm) high. The four-cylinder engine was bored out to 1,871 cc and fitted with twin carburettors, so that the overhead valves could deliver 115 bhp at 5,000 rpm to the front wheels. The synchro-mesh four-speed gear box was operated by a floor-mounted gear lever and the front wheels had disc brakes. This was not an unnecessary luxury, since the car had a top speed of 116 mph (185 km/hour). 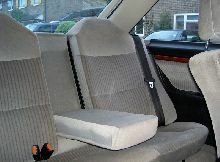 The 100S remained in production until 1976 and 30,687 of them were sold.Practical Classics April 2006 - Featuring Buyers Guide Audi Coupe available. Click here to view in our shop.